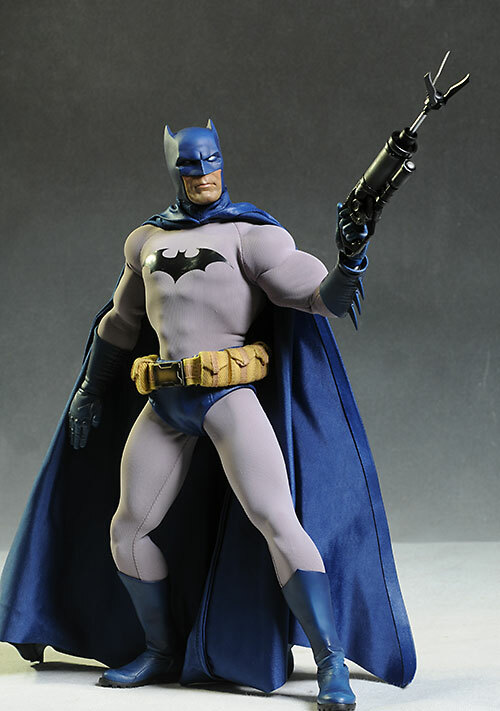 When Sideshow started their sixth scale DC comic book license, they did something fairly unusual - they skipped the big boys, Batman and Superman. While their first figure selection of the Joker isn't exactly a rare character, it is an unusual way to start off a new series, and they followed that up with two more villains in Catwoman and Harley Quinn. But you knew they'd get around to one of the hero cornerstones sooner rather than later, and Batman has finally started to ship. This guy comes in two varieties - the regular, and the exclusive with one additional accessory. Since you could originally get either through Sideshow for $199, the exclusive was certainly the better deal. I'm reviewing the exclusive tonight, but all the scores are pretty much applicable to the regular release as well. The shoe box style container follows the same pattern as the previous releases - basic black, with a logo on the front to differentiate it. There's also a nice cardboard insert that covers the plastic trays on the inside, adding a bit more Batman art to the overall package. It's all completely collector friendly, and it's all very classy in it's simplicity. 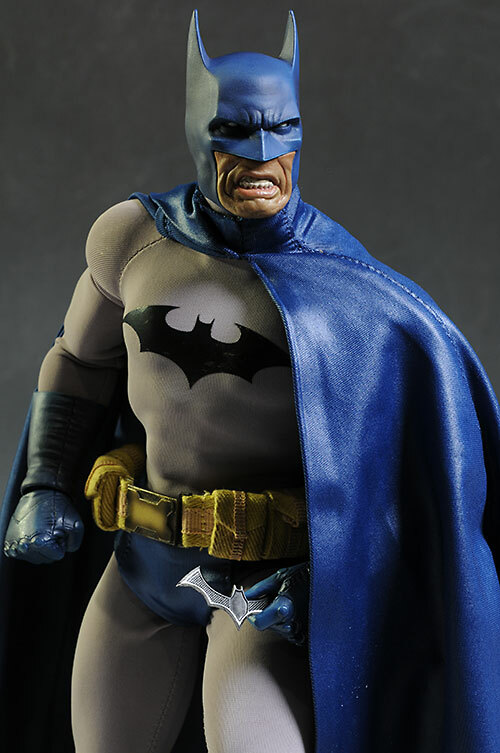 The exclusive includes three cowls and three face plates. 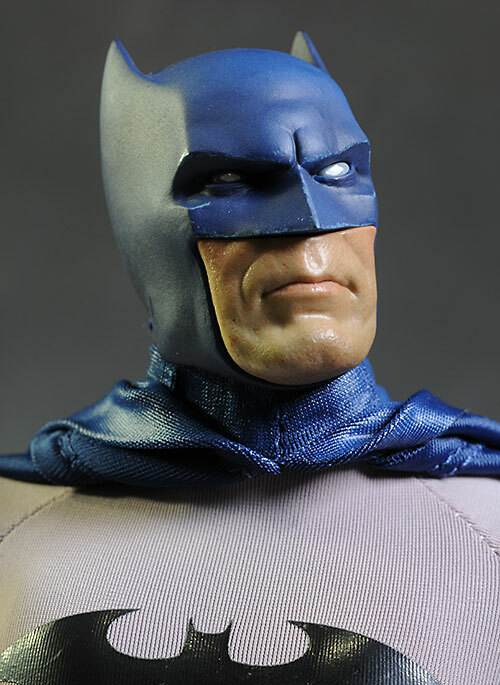 Each of the lower face pieces can be removed and swapped into any other cowl, giving you a total of nine looks. All that choice is a great thing, but I suspect most people are going to settle on the same pair. The three varieties of cowl are short eared, long eared, and long eared with battle damage. Of these three, the short eared is likely to be the fan favorite. 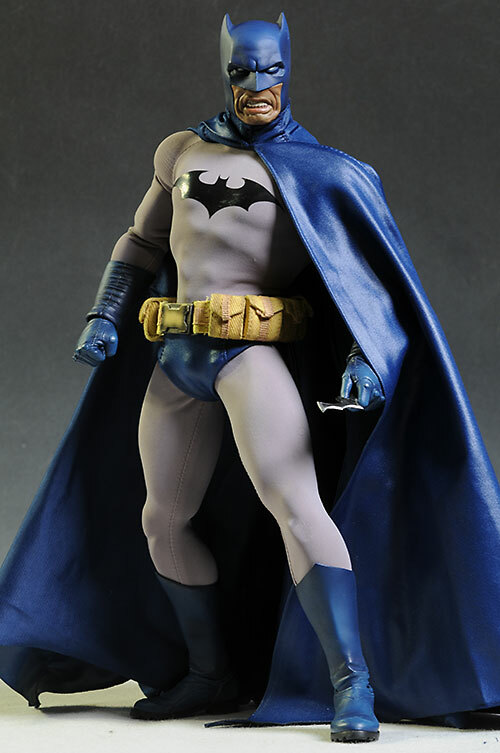 It looks fantastic with the blue and gray uniform, and really speaks to the classic silver age look of the character. That's not to say either of the long eared versions are bad. The regular is, well, regular - the long ears aren't extreme, and it does fit a bit more with a modern style. 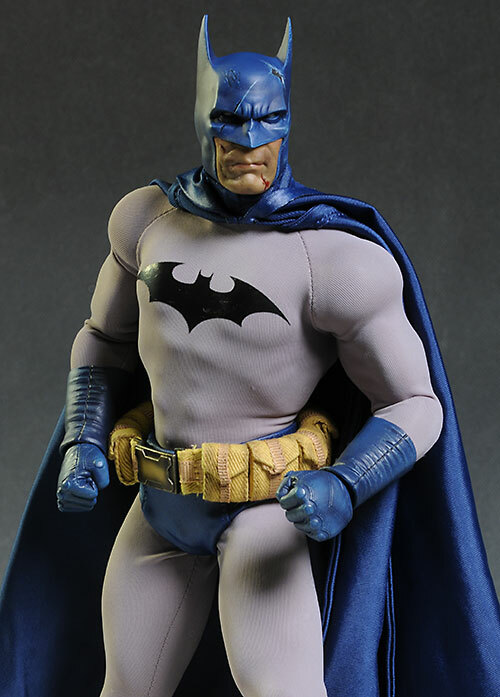 The battle damage added to the third version isn't simply painted on, but sculpted as part of the cowl. There's some interior armoring exposed on the the crown, and there are deep scratches and a broken nose added for additional effect. The three face plates pop in and out easily enough, although I suspect some people will complain that the edge line between the two is too obvious. 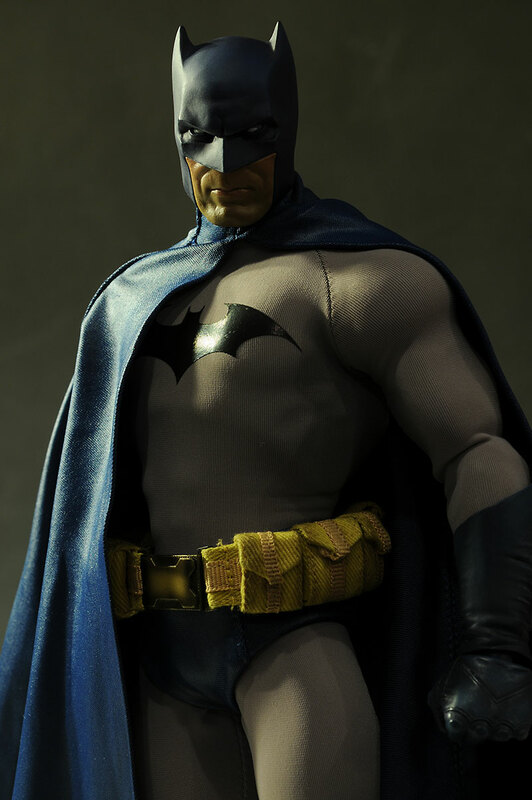 I don't think so - the cowl would look separate from the skin in real life as well - but it's worth noting. The neutral expression is going to be a favorite as well. Let's be honest - it works with the most poses. It's not wimpy or zombie-like either, simply determined. The battle damaged face has not only some added blood, but some swelling and bruising. I don't expect a lot of people to go with this look, but it was well done. Finally, there's the angry, snarling look. It's extreme. Very extreme. But this is NOT a human character, but a comic art version. Comic book renditions have this same sort of extreme dynamic all the time, and that's the look they are after here. In any sort of battle diorama/display, this would be the way to go. The detailing and texturing on all these is excellent, and they've managed to capture the comic look without tying themselves to any one artist or period too tightly. I'm extremely pleased with the end result, although I did knock them off slightly. My only issue is with the size of the nose and the area of the face above the lips. The nose on all three cowls is very flat and very small, making it tough to imagine any sort of nose inside there. Yes, as I said this is a comic book look, but the small nose was a bit too extreme for me. Couple that with the large expanse of flesh between the bottom of the nose and the top of the lips, and the portrait ended up having some proportion problems to my eye. Still, this is easily the best comic styled Batman we've ever gotten in this scale, and I'm betting it won't be the last from this series. The paint work doesn't quite have that uber-realistic quality that we've come to expect, but it really shouldn't. This should look like something from the pages of a comic, and in that respects it does fantastic. The colors are very clean, very consistent, and cut lines are sharp and neat. There's a nice use of gloss as well on the gums and teeth, and the skin tone is much more life-like than you might expect. Again, I do have one nit that holds him back from a perfect score. The eyes are painted white, but it's not quite as clean as the rest of the work. The white doesn't quite cover the entire eye consistently, and there's some blue bleeding through. That's a minor nit however, and one that you will only notice with some very close inspection. This is an all new body, and it's tremendously heroic in it's style and proportions. 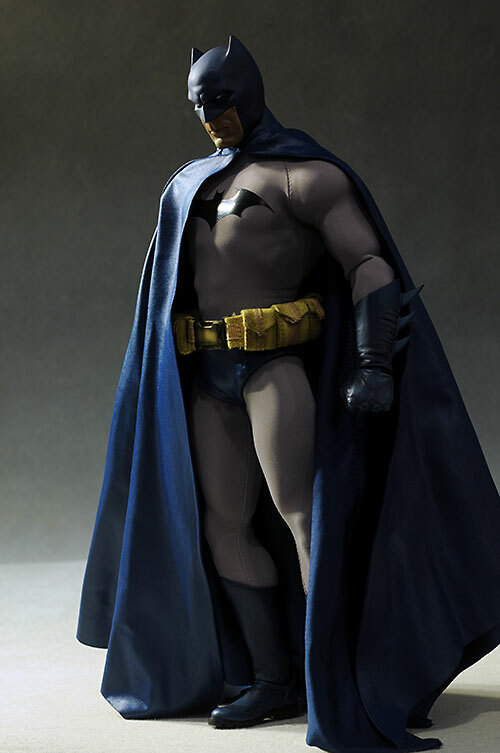 It isn't tremendously tall - at just over 12", he'll fit in with the rest of the Sideshow and Hot Toys characters. However, it's very bulky, done in true comic book style. It's also very articulated. The limbs and various pieces are solid, making him a hefty figure too, but I had no trouble with any loose or floppy joints. I've heard that some folks have had issues, particularly with the elbows, but mine was tight and had no trouble maintaining poses. The hips even have ratchet joints, the sort that click into place as you move the limb. These weren't' extreme - it didn't snap into place, but rather rolled through the clicks. Still, it adds quite a bit of stability to some of the deeper more extreme stances. There's ball joints every where, with the neck and ankles being particularly useful. I also like the torso joint quite a bit, and found that it added a lot of personality to various stances. My only complaint, and the only thing holding this back a half star, is the elbows. They are a single pin design (unlike the double pin knees), and the very large biceps tend to block the movement quite a bit. It does limit you a bit with the arms, a price you pay for the extra bulk. There's a very solid assortment of extras here for both the regular and the exclusive. 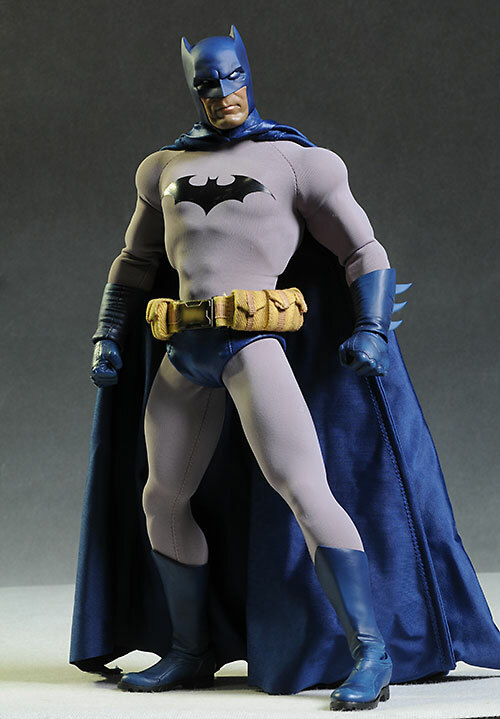 Both versions come with a short eared cowl and long eared cowl, allowing you a lot of leeway in your display. 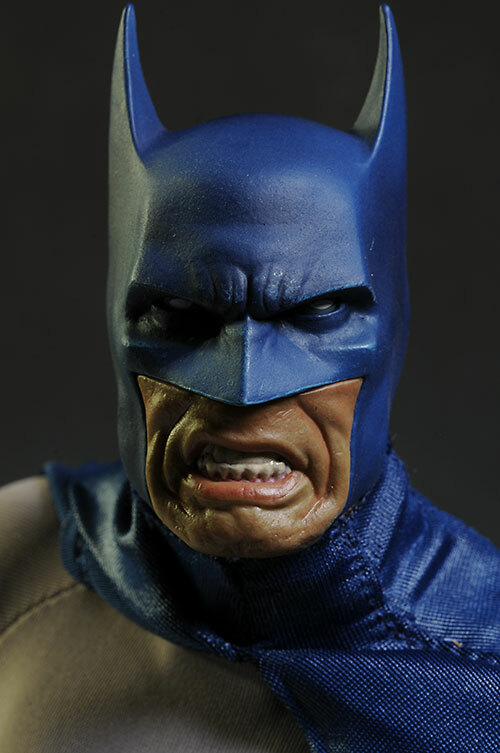 The lower faces are removable, and the short eared cowl comes with a neutral face, while the long eared version comes with a very dynamic scowling face. 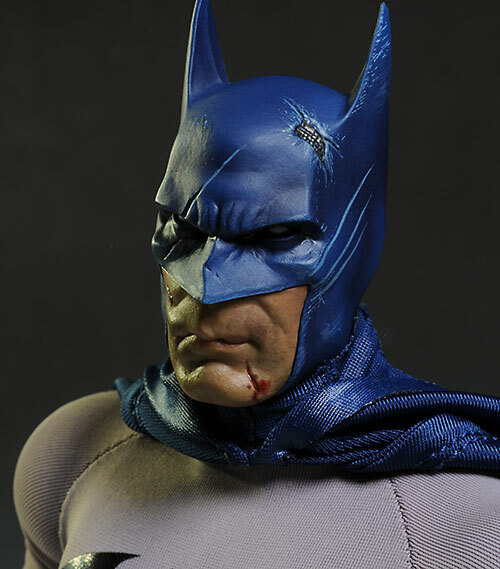 The exclusive includes a third cowl and face, this one quite 'battle damaged', i.e. he's had the crap kicked out of him. With the scratches on the cowl, it looks like Catwoman might have had something to do with it. I've already gone over the pros and cons of these three in the Sculpt and Paint sections, so there's no need to rehash that here. However, getting three of each - allowing for a total of nine different looks - is a huge boon to the Accessories score. 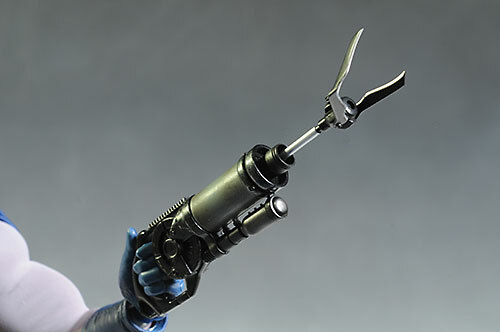 Both versions come with a grappling gun, and there are two different grapple hooks. Technically there is only one grapple hook end, and this is attached to either a rod that is sticking out of the barrel of the gun, or it can be attached to a rod that is then attached to the gun with a long string. Again, lots of different posing possibilities, and the three grapple hooks are even articulated. There's also a small assortment of batarangs. Three are small, while the fourth is a larger more traditional look. These can be held in either the right or left hand provided for that purpose. Speaking of the hands, there's quite a few. 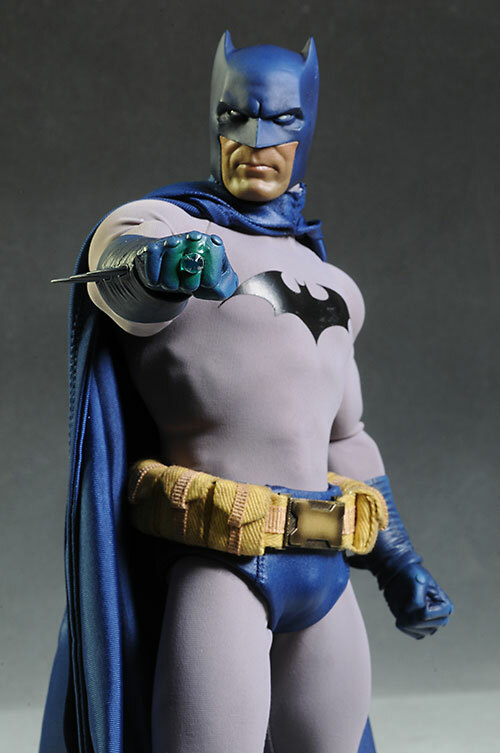 There's a pair of fists he comes wearing, a pair of 'karate chop' open hands, a pair that can hold the batarangs, and oddly, two left hands that can grip the gun, with only a minor difference in sculpt. To finish it off there's one extra right hand that's wearing the Krytonite ring, just in case Supes gets out of hand. I docked them a half star in the category because of the slightly odd choice with these hands. The chop pose hands are pretty worthless - it's a silly pose anyway, and works with very few stances. Instead, we should have gotten something either relaxed to hold the cape to the side, or splayed for fighting poses. On top of that, the lack of any right hand sculpt to hold the gun seems weird. Rather than give us two lefts that were barely different, one left and one right that would work with the gun seems the obvious choice. Still, they did one very positive thing with these hands that I really wish Hot Toys would copy - every one comes with its own wrist peg. Finally, both versions of Batman come with a display base, fairly standard stuff but sturdy enough to hold him in jumping and fighting poses. I really like the new body - I really like the short eared, neutral head sculpt. But the thing that puts this figure over the top is the costume, especially the cape. 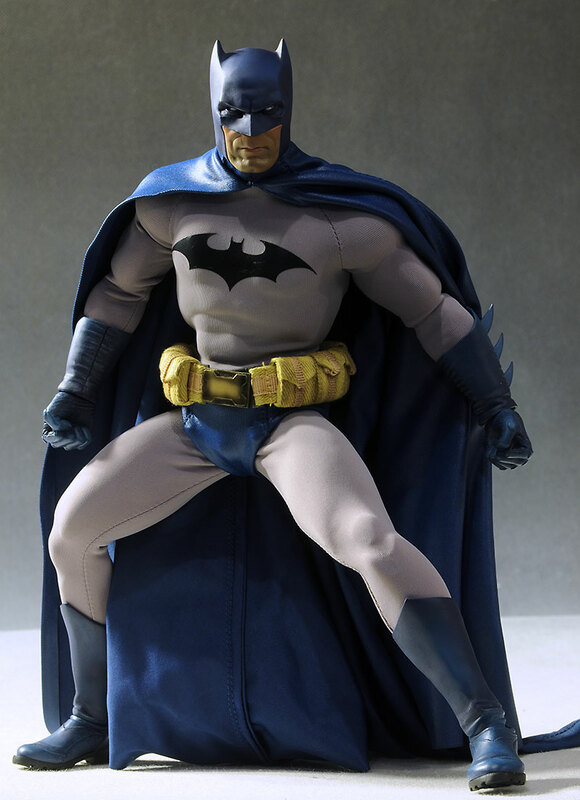 The outfit consists of the stretchy body suit, the bat-undies, the boots and gauntlets, the belt, and the cape. The body suit looks great in gray, fitting tightly over the muscled body. I did notice the symbol seems to have some fluff coming through, but you'll have to look careful to notice. The boot and glove sculpts are great, and allow plenty of mobility for the wrists and ankles. The undies fit tightly, and matches the material of the cape. The belt is a highlight, made from cloth and metal. The worn brass buckle looks fantastic, and while the pockets aren't usable, they do have just the right amount of wear and dirt. And then there's the cape. 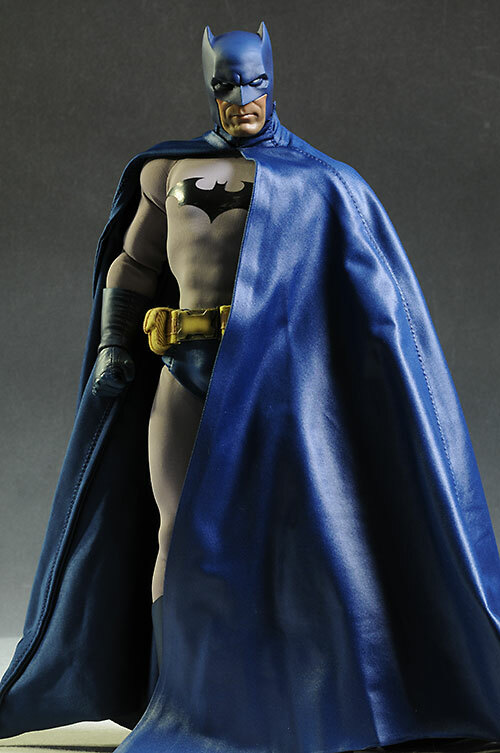 This might be the finest sixth scale Batman cape we've ever gotten. The heavy material flows and hangs beautifully, and the tailoring is perfect. It makes this figure pop on the shelf, and it makes posing him a joy. This guy is a ton of fun to pose and rearrange. The underlying body and nice assortment of extras make him fun for the collector and kid alike, and he's a very sturdy example of a high end collectible. Considering the three heads and three face plates, the $200 price tag seems very good when compared with other high end sixth scale figures these days. That's not to say I'm entirely happy about the direction the entire market is taking, but Sideshow's price here, when taking the rest of the market into consideration, is about average for the regular release, and slighlty above average for the exclusive. How many movie and tv based Batmen have we gotten? I don't even want to count - it's been a lot, obviously. But comic based versions in sixth scale have been non-existent for several years, and when we did get them back in the day, they were awful. There's a lot of positives about this release, including the excellent underlying comic book body, the nice assortment of extras including three portraits, and the fantastic belt and cape. The nits are few and fairly minor, holding this guy back only slightly. Sideshow is doing an excellent job with this license, and I can't wait to pick up the upcoming releases to add to the collection. I'm particularly anticipating Supes, who will be the perfect pairing with this Batman and his Kryptonite ring. - Sideshow has the regular for $200, as well as the exclusive, although you'll have to get on the wait list for that one. - has the regular for $190. This is the fourth release in their DC line - Catwoman, Joker and Harley are already out.